In the early part of last century abstraction began considering something as simple as the power of multiple intersecting lines. The clarity of the grid evolved to become, in Rosalind Krauss’ words, “modern art’s will to silence, its hostility to literature, to narrative, to discourse.” Matthew Kolodziej’s paintings begin at this point in more ways than just the literal. But Kolodziej’s motivations are different from the meditative “will to silence” of, say, Agnes Martin. 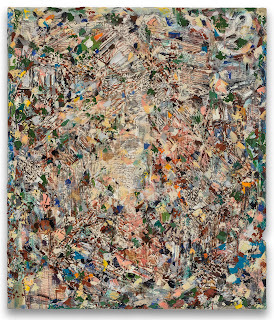 His grids, the fundament of his work but also the least apparent in the finished piece, create a tension between context, representation, abstraction, and history. 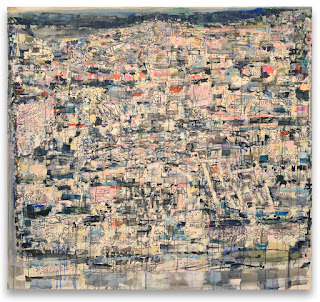 Kolodziej begins by projecting grid-esque manipulated photographs of rust-belt construction and demolition sights, and then traces the projected image onto canvas. Belying what seems like a technical process, the traced lines are loose and calligraphic, more in the style of Marden’s Cold Mountainpaintings than the cold precision of Sol Lewitt’s gridded wall drawings. Kolodziej then begins to, depending on how one looks at it, either obscure the traced grid with delicately applied globs, crusts and patches of paint, or fill in the grid with fragments of architectural detail. This tension in seeing, in how one reads these gestural patches, is the often-explored tension between abstraction and representation. 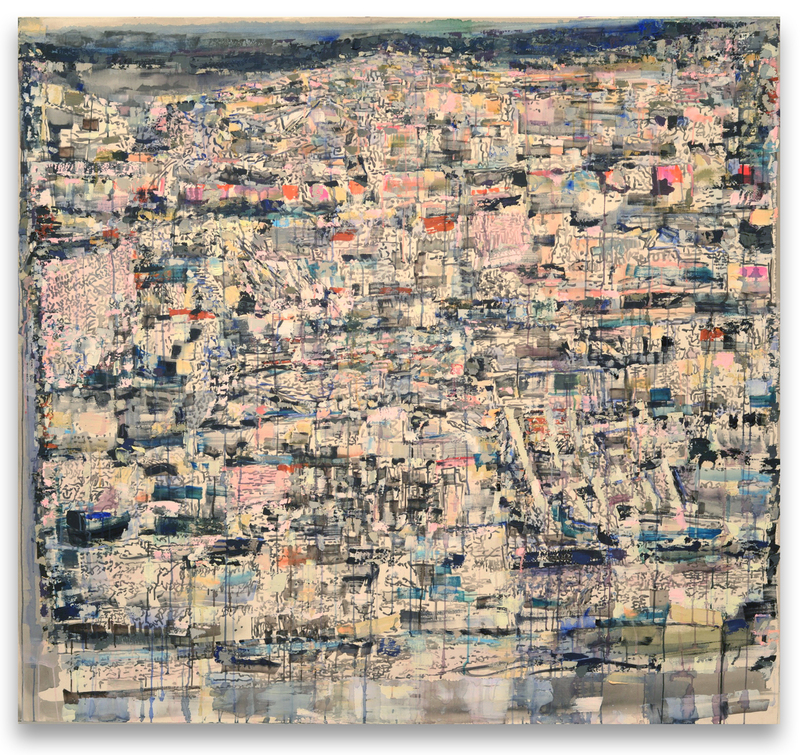 For Kolodziej, “architectural sites in flux provide the foundations for these paintings.” Critics have correctly observed that Kolodziej’s paintings are reminders of the decay and wreckage of our cities and, I would add, perhaps our humanity. 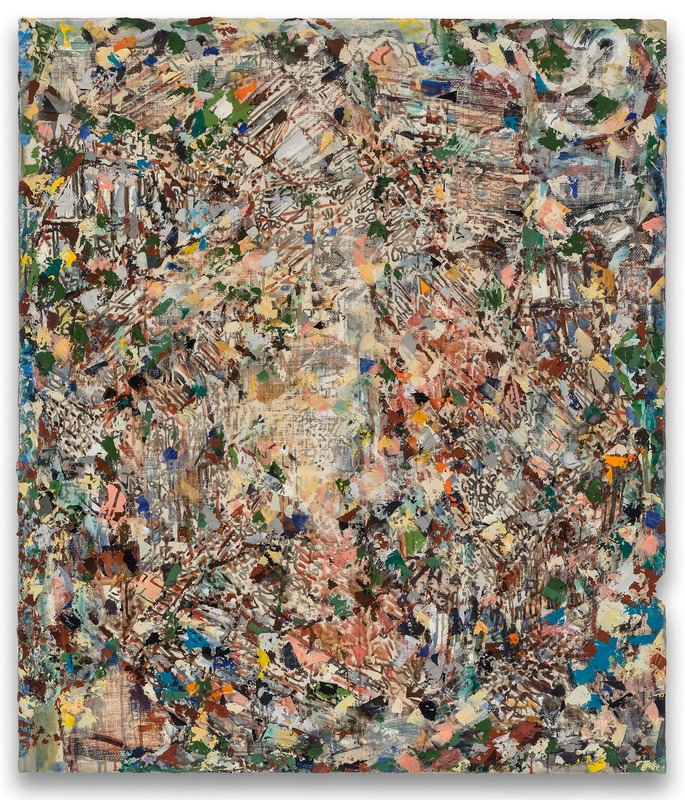 Artist Joe Fyfe wrote of Kolodziej’s paintings: “It’s as if we were staring into a sump containing the physical evidence of recent tsunami, military action and terrorist attacks.” This all sounds pessimistic. But it has also been correctly observed that something in these paintings is uplifting; what Doug Utter called a “sense of giddy freedom.” In Oculus, patches of thickly applied paint culminate around a bright, vaguely round center. This center is the oculthat, like in architecture, provides a sense of elevation and symbolic relation to the heavens, or whatever you may choose to call it. Amidst Kolodziej’s wreckage is optimism in teleological sense. ‘Oculus”, 2015 acrylic on canvas, 49”x42”. Courtesy of Carl Solway Gallery and the artist. We’ve been taught to be deeply suspicious of teleologies. In simplistic terms, art has spent the better part of 30 years reacting against modernism’s grand narratives. Kolodziej’s work is simultaneously part of that reaction and, more importantly, questions its efficacy. For Hegel, a champion of teleological thinking, art was the presentation of the idea in sensuous form. In each of the paintings in Patch Work,Kolodziej presents (and unites) his ideas concerning the wreckage of contemporary artificiality and consumerism with sensuous paint handling and graceful composition. This sounds formalist, but Kolodziej must invoke (without succumbing to) formalism, using modernist emblems like the grid, in order to raise these important issues. He does so elegantly, with the appropriate amount of deference to the history of abstraction (one cannot paint this way without being historically conscientous) and postmodern detachment. “Shanty”, 2015, acrylic on canvas, 72”x79”. Courtesy of Carl Solway Gallery and the artist. –Matthew Metzger is an artist and designer based in Cincinnati. His paintings are represented locally by Miller Gallery, and his furniture by Voltage, as well as other galleries and design showrooms nationally. His website is www.metzgerfinearts.com.